Crown Reef Beach Resort and Waterpark in Myrtle Beach, SC is a family-friendly resort filled with summertime activities, seasonal events and holiday celebrations! Join us during the summer for a fun combination of activities and poolside entertainment for the whole family. You won’t even have to leave the resort if you don’t want to. We provide all of the fun for you! View our current schedule below and begin making plans to spend your next vacation at our waterpark resort! Total Activities Pass: Purchase our activities pass to enhance your summer activities experience! With it you will receive: a slice of pizza at bingo, a bag of popcorn at movie night, decorate your own sail boat craft, one glow stick item at the glow party, a sand art necklace craft, one tie dye t-shirt craft, one craft at craft hour, and a keepsake frame. The pass is $25 per person and is available for purchase at the front desk, or from any of our friendly activities’ associates! 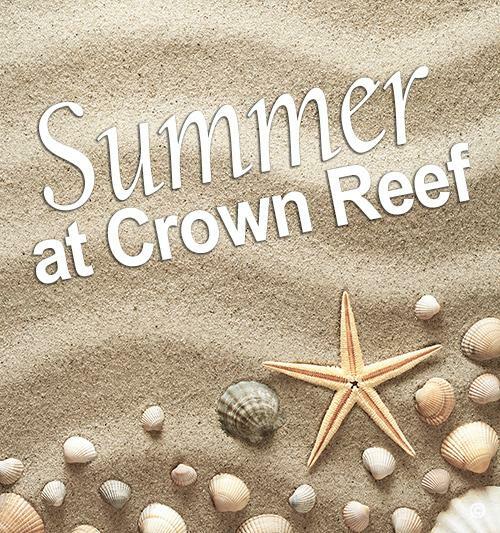 Here at Crown Reef, we have an array of activities taking place all summer long Mondays through Saturdays through September 3, 2018. Browse our schedule below and learn more about what we have available for children, adults and families! All activities take place at the Tower 2 Pool Deck unless otherwise noted. 6pm to 8pm Family Game Night | Join us for some family fun and show your competitive side. Individuals are also welcome to participate! 6pm to 8pm Bingo & Pizza, $3 Slices, $3-$5 Bingo Cards | Grab N’ Go | Try your luck for a chance to win some awesome prizes and curb your appetite with some delicious pizza! Advanced registration required. 8pm Evening Beach & Nature Walk | Meet at Tower 2 Pool Deck Beach Access | Please arrive a few minutes prior to 8pm as we will leave promptly at 8pm. 6pm to 8pm Kids Night In, $10 per child | Kick back, relax and leave the kids with us! Our activities staff will provide two hours of fun-filled entertainment. Ages 4+, advanced registration required, limited number of spaces available. 7pm to 8pm Card Games | Join us for some fun classic card games such as Go Fish! Friendly Reminder: All activities are cash only. You can sign up in advance with an activities associate for any activities that require advanced sign-up. Please note activities will be cancelled after 15 minutes into the event if there is no one in attendance, and can be canceled or moved due to inclement weather. Join us for seasonal entertainment for the entire family this summer through September 3, 2018. 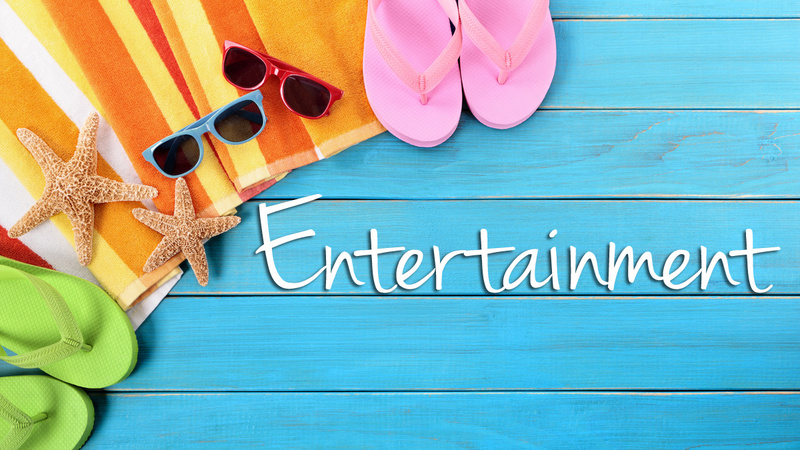 Most entertainment takes place poolside on Tower 2 Pool Deck, allowing for you to enjoy the sun, pools and entertainment all in one convenient location. 11:00am to 1:00pm Live Poolside Entertainment – Have your camera ready for an appearance from Salty the Shark! 8:00pm to 11:00pm Glow Party | Glow in the dark merchandise will be available for purchase! We will have glow games and music for all ages at this party. Throughout the year we host various holiday activities at our Myrtle Beach resort. Stay tuned for information on upcoming holidays such as Thanksgiving, New Year’s Eve, Valentine’s Day and more!